Occupiers took Wall Street and protested in front of the New York Stock Exchange by getting out of bed just a wee bit earlier than the competition, the NYPD. The arrest of 100 protesters around the nine o'clock hour delayed the trading session's opening bell. 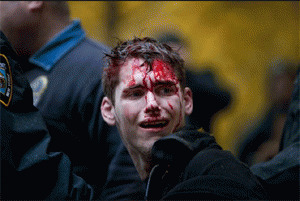 Just six hours later, in a windy and rainy Liberty Plaza (Zuccotti Park), the NYPD would spill the blood of an Occupier in a violent beating during an arrest for wearing a mask. Then, at five o'clock an estimated 32,650 (Source: NYPD) would take Foley Square and march in protest over the Brooklyn Bridge. Just sixty days after the first protesters took Liberty Plaza, the OWS has grown into an important political and social movement with scores of Occupations around the United States. It has managed to refocus the national debate from budget cuts to joblessness, diminishing opportunities, inflation and financial hardship. Occupier Chris G., who has protested every day in lower Manhattan since the OWS began on September 17, said the Stock Exchange march and protest was, "the greatest thing I've ever seen." Foley Square was to be OWS's point of assembly for the day, but since the city's destruction of the Liberty Plaza encampment in the dark early morning hours of November 15, Occupiers decided to retake the public space after the Stock Exchange protest. Brookfield Properties, owners of the Liberty Plaza public space, now have the park surrounded by three layers of NYPD steel barricades with private security monitoring what citizens bring into the park. The entry to the park was through a single four foot wide opening, essentially caging everyone inside. Police I asked were not able to explain how this enhanced safety. By eleven o'clock, over three thousand people had returned to the park. Ten remote television vans set up on the south side and hundreds of police in full riot gear surrounded the perimeter. A noon march back to Wall Street and the Stock Exchange was thwarted by police who closed the Wall Street entrance at Broadway creating a bottleneck of pedestrians and protesters. Prior to the Tuesday ransack, OWS was an organized and predictable protest with a structure and a plan. By breaking up the encampment Mayor Bloomberg has effectively created many protests out of one, cutting off the head of the Hydra only to watch it grow many more. The result is a less stable event with police enforcement that is disjointed and unable to keep up. At two o'clock Occupiers managed to move a number of barricades allowing a free flow of people in and out of the park. The overall number of protesters grew into the thousands with Union workers having lunch and the arrival of Occupiers from encampments in nearby cities. Then a sudden panic erupted from the northwest corner of the park where a group of NYPD officers ran down a protester who refused to remove his mask. Occupiers watched in horror as the police beat the man and smashed his head into a granite curb. Other demonstrators were shoved and pushed about. Protesters made peace signs in the air with both hands and chanted "peaceful" over and over to no avail as still more police rushed into the crowd. No matter where protesters moved, police wanted them to move elsewhere. By four o'clock the police had arrested some 177 protesters. Later, in a statement with Police Chief Kelly, Mayor Bloomberg claimed 10 police officers were injured.